Soosososooooo I’ve decided to change things up around these parts. Rather than showing you everything I lay mouth on in a single day, I’m going to start highlighting a bunch of yums throughout the week. It’s important to me that you see that while I try to balance a nice mish mash of wholesome and fun foods, I also eat boring food. And that’s a good thing! It’s ok that every meal isn’t a gourmet experience. It’s ok when your lunch doesn’t include something green. It’s ok if dinner is a frozen burrito. Sometimes those are the best days! I didn’t do a good job of it this week, but I’m going to start consciously making an effort to capture the moments when meal time isn’t the center of my world. When we get order pizza with half pepperoni and half banana peppers this Friday and don’t have salad on the side. When dinner is eggs and toast. I’m human…you’re human…let’s embrace our humanness together! Here’s to celebrating eating not only yummy meals in the comfort kitchen, but also eating quick n’ tasty meals out on the go and good old cereal for breakfast. I hope this inspires you to be beautifully imperfect and to embrace the ebb and flow of routine given the season of life. Before we begin, I wanted to let you know that my amazing friend Jamie Mendell’s Master Your Life program begins October 16th! I met Jamie at the Big Soul retreat in Santa Barbara in August and she seriously lit my soul on fire. She’s helped hundreds of women transform their relationship with food and beyond. Jamie teaches that deep self-care and self-love is what we as women truly need to stop hating our bodies and freaking out over food so we can create a normal, loving relationship with food and feel confident in our own skin. 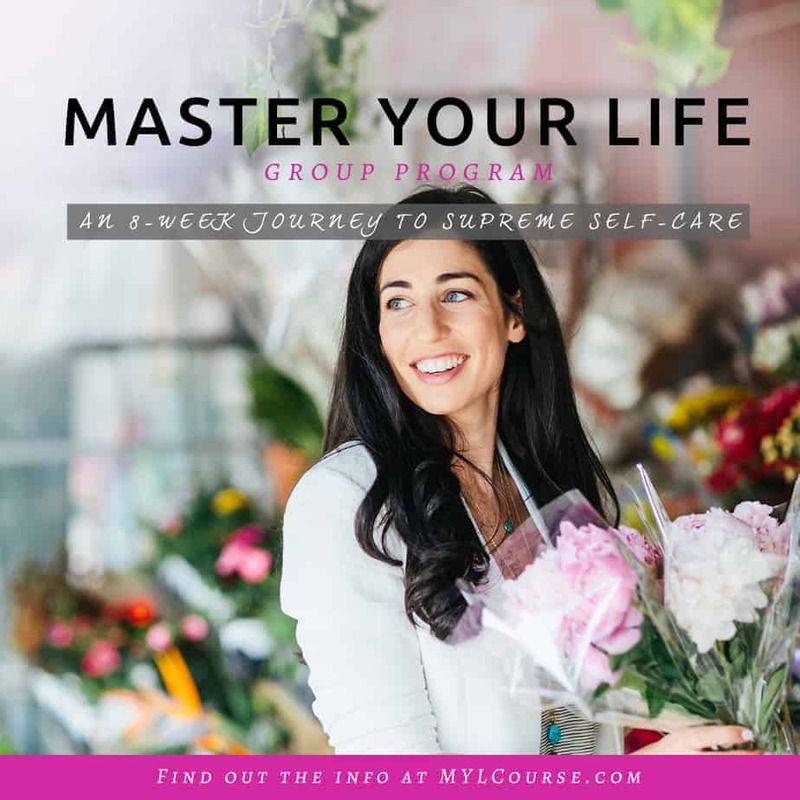 If you struggle with food or self love, I’d encourage you to check Master Your Life: An 8-week Journey To Supreme Self-Care! 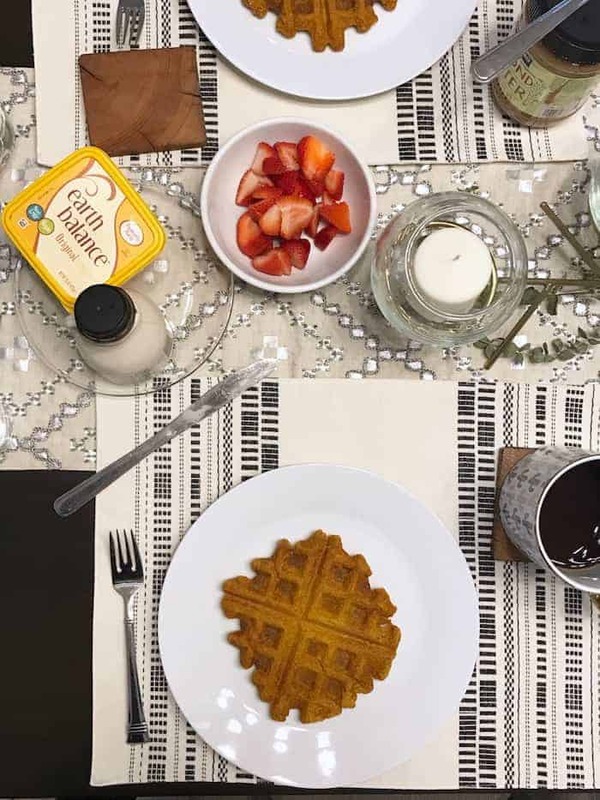 The BEST Pumpkin Waffles from Vegan With a Vengeance served with almond butter, maple syrup, Earth Balance, strawberries, and tons of coffee. Pumpkin Pie Smoothie with vanilla brown rice protein and spinach. 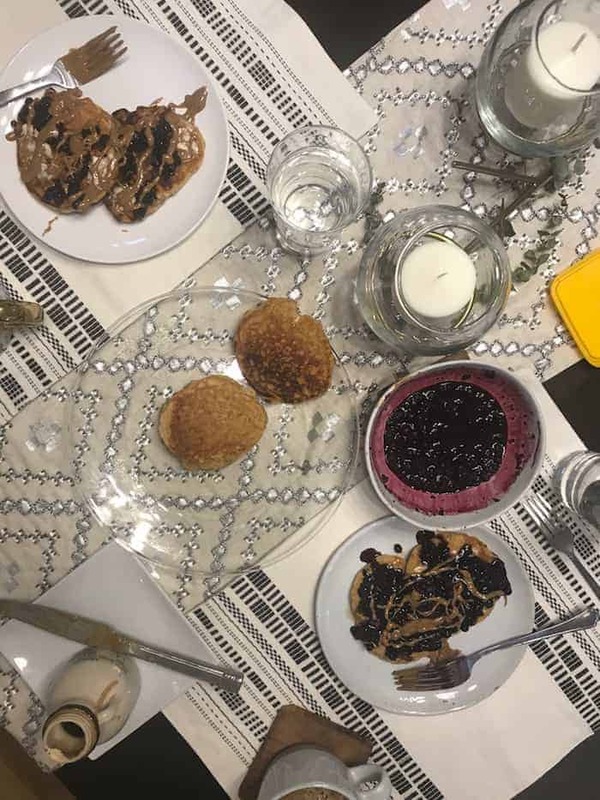 Pancakes made with Simple Mills mix topped with blueberries, almond butter, Earth Balance, and maple syrup plus tons of coffee. 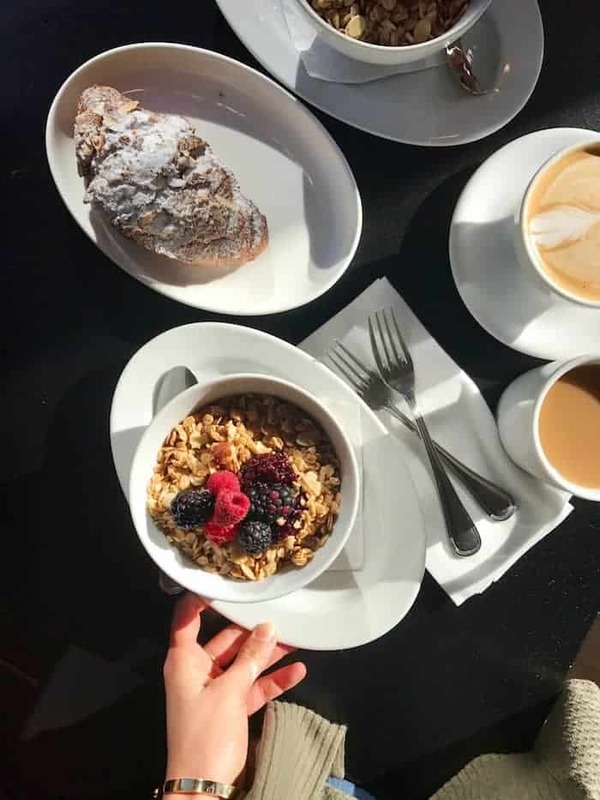 Yogurt parfait with house granola, jam, and berries + the best almond croissant ever from Pistacia Vera. 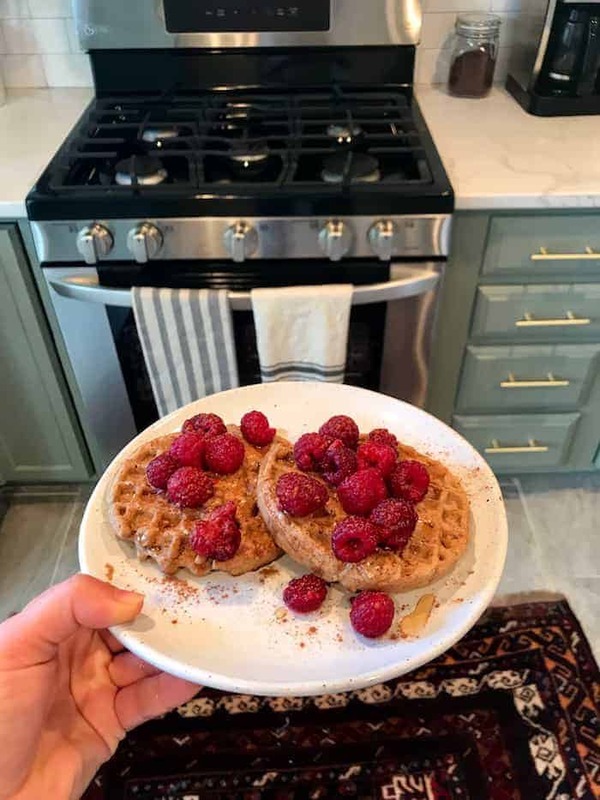 Van’s frozen waffles with butter, almond butter, maple syrup, and raspberries. The Jimmy Pesto egg sammie from TRISM with baked eggs, hemp walnut pesto, and roasted tomatoes on focaccia. TRISM mish mash bowl on the go with smokey beans, cilantro lime hummus, black rice, massaged kale, sweet potatoes, pickled radishes, and cilantro lime crema. Nutty Dragon smoothie bowl with pesto avocado toast from Alchemy. Tofu pad thai, green beans, and tuscan kale salad from Whole Foods. 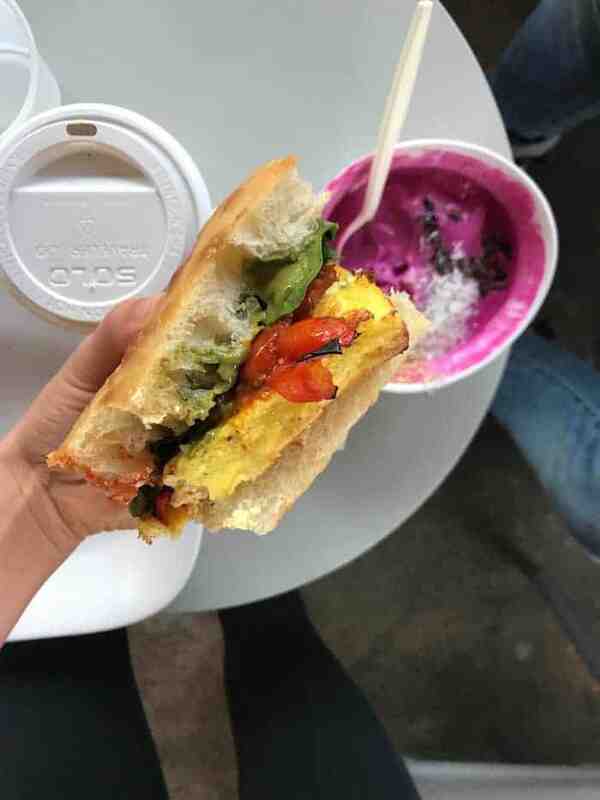 Ultimate Veggie sammie with tomato bisque and a cold brew with soy milk from Alchemy. Stir fry with tons of veggies, quinoa and wild shrimp. Scrambled eggs with veggies + avocado toast and strawberry avocado toast. Chili with this bomb Brown Butter and Honey Cornbread and smoked gouda. Chickpeas and Dumplings…so freaking good. This amazing Pumpkin Lasagna (I cooked regular whole grain noodles ahead of time, cooked it in an 8×8 pan, added a half batch of tofu ricotta, added 1 tbsp butter to the pumpkin sauce, used fresh rather than frozen spinach, left off the potato layer, and made sure everything had lots of salt and pepper). Trader Joe’s mini chocolate hazelnut biscotti. Cheryl’s pumpkin cookie with cinnamon butter cream. Pumpkin donuts with salted chocolate glaze (using Simple Mill’s pumpkin muffin mix). TRISM pumpkin cookie with chocolate chips. Final notes: I want this wreath for my front door. And these eco camo joggers for my legs. And this marble and gold side table that I definitely don’t need. PSA my favorite Tom’s black suede booties are 50% off right now and they’re a freaking dream. You can wear them all day long with zero discomfort. 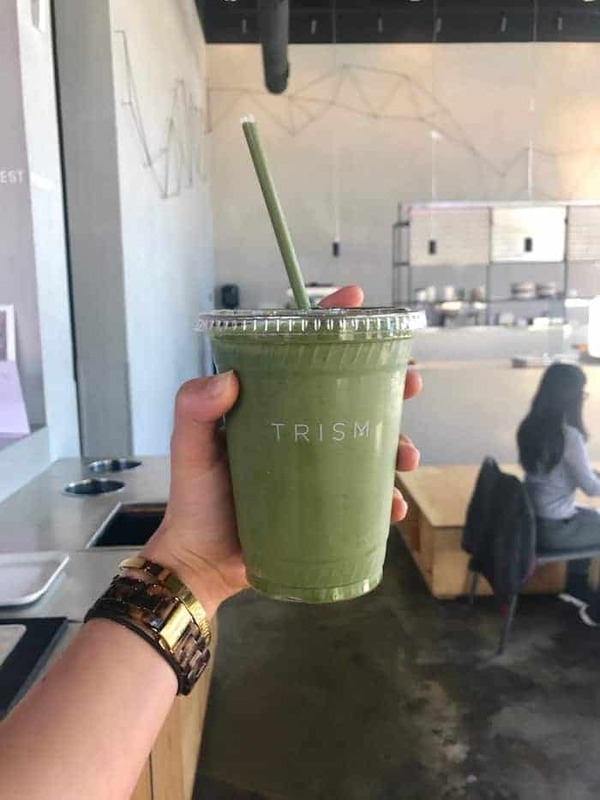 This post makes me wish I lived near enough to try TRISM, their stuff looks delish! The TRISM mish mash bowl looks so delicious. And let’s not forget the donuts! I do wish we could get food like this in Hong Kong! 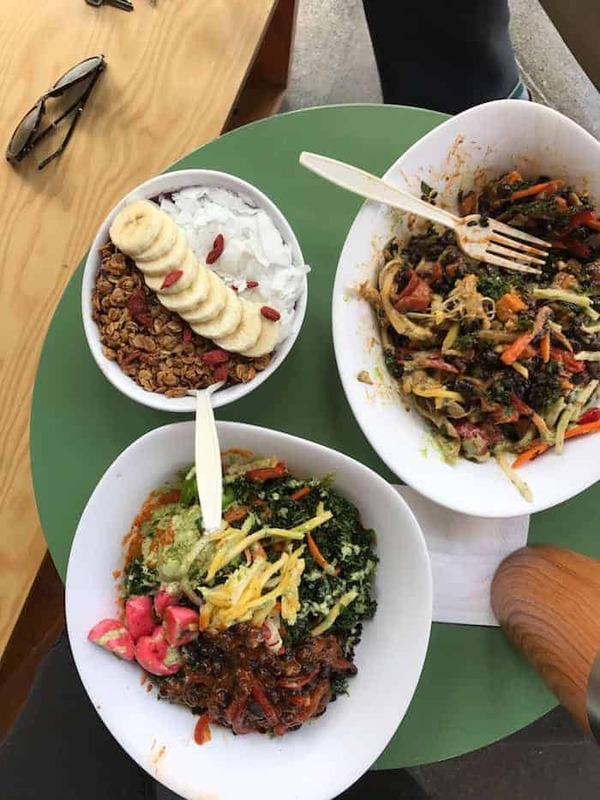 I’m envious of how colorful your meals are! Those TRISM dishes look incredible! YES! Its important to me to show ALL my kinds of eats on my blog too. A healthy balance is the best. Can you open up a TRISM in SF? Everyone would LOVE it. Very SF style and I’m so jealous of all your food from there! Love this new approach! Also, it’s deeply shameful how happy I’d be if frozen waffles played a key role in, like, 65% of my meals. I love this style and your message! There are plenty of delicious meals that aren’t eye-catching or are eaten on the go. Life happens, and I love that we can celebrate that as well as acknowledge that none of us are perfect. Here’s to embracing our humanness! HI, I am making breakfast for dinner tonight and would like to make the Pumpkin Waffles… where is the recipe? Love the new concept of your “Eats” posts! I’m totally the same in that at least half the time, my meals are as un-gourmet as they come ;) thank you for always keeping it real, Alexis! omg that chili and cornbread is sooooo beyond perfect for when it finally cools down around here!! 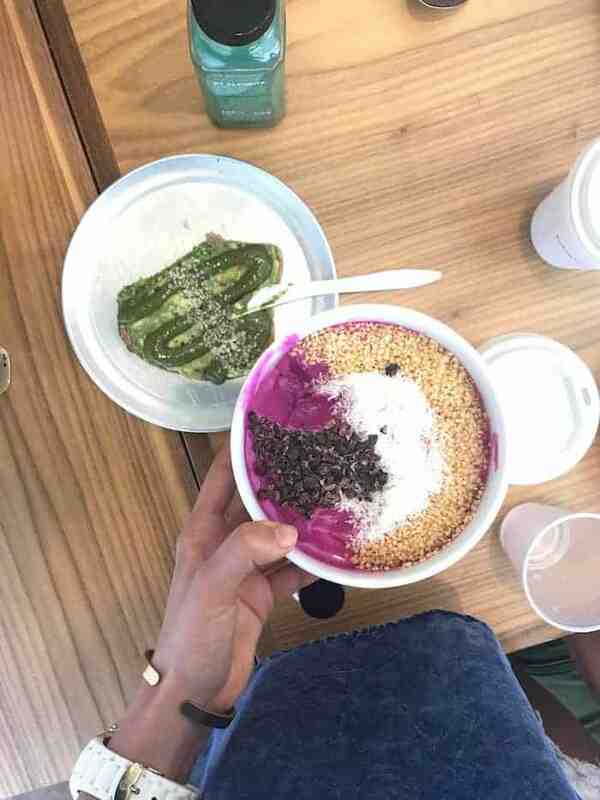 and now i’m totally craving an acai bowl, so definitely getting one of those for lunch! i’ve yet to try putting strawberry on my avocado toast, but i love the sound of it!! Not only does all of this look delicious, but I love the message in this post. It’s so important to show that healthy eating isn’t always glamorous or perfect. It’s all about balance! Thanks so much for sharing. Love seeing what you eat Alexis! It’s on my bucketlist to make it out to alchemy one day if I’m ever in the area! Every bite of this looks amazing! That pumpkin donut makes me weak in the knees. I was just thinking about making the pumpkin donuts I made last year =) Also, must buy those booties. They’re perfect for any outfit! Yay! I like this new approach! Also this post makes me want to visit Columbus solely to eat at Alchemy and Trism. You might consider a meal service delivery system-that would be amazing! What a yummy week of eats! It just got cool here in Galveston and that chili and cornbread sounds amazing! Also all your eats from TRISM plus the pumpkin desserts look amazing! Also love the concept of showing less than perfect meals!